Gillette is the official sponsor and official grooming partner of The British & Irish lions 2017 Tour to New Zealand, the biggest sporting event of the year. 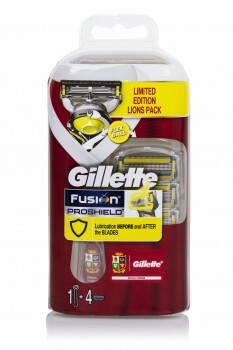 As it is the official sponsor of this sporting event, Gillette has released the Gillette Fusion ProGlide Limited Edition Lions razor. The Gillette Fusion ProGlide razor features FlexBall technology. It responds to contours, getting virtually every hair. It also features 5 precision blades that helps reduce the pressure per blade, for an incredible comfortable shave. With Gillette’s thinnest and finest blades, ProGlide allows less tug and pull on the skin. This razor comes complete with a Precision Trimmer on the back of the razor, great for edging tough areas such as under the nose and sideburns. This ProShield Lions pack includes 4 blade cartridges and a Lions logoed ProShield handle. The RRP is £16.00 and it is exclusive to Tesco.